圖1. 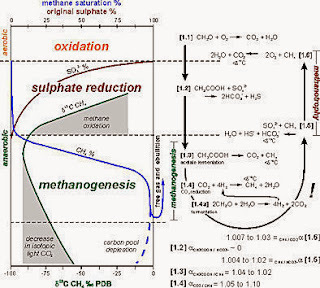 Anaerobic oxidation of methane (AOM): Archaea in the picture in red, sulfate reducing Bacteria in green. 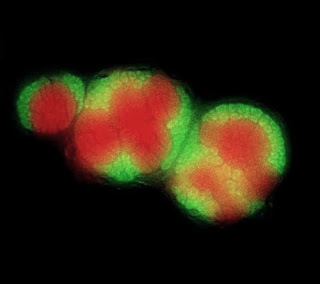 Microscopic image of a AOM consortia from deep sea sediment samples after Fluorescent in situ hybridization. 圖2. Schematic drawing of the magneto-FISH procedure. (a) hybridization of target cells with a horseradish peroxidase (HRP) labeled oligonucleotide probe. (b and c) Intracellular deposition of fluorescein labeled tyramide molecules catalyzed by HRP. During the CARD-FISH procedure, fluorescein molecules bound to cellular proteins partially or fully protrude outside of the cell. 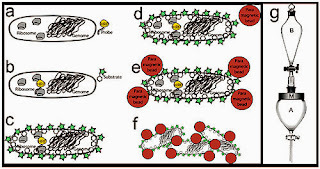 (d) Addition of anti-fluorescein coated paramagnetic beads to hybridized sediment suspension. (e) Binding of anti-fluorescein coated beads to fluorescein labeled target cells. 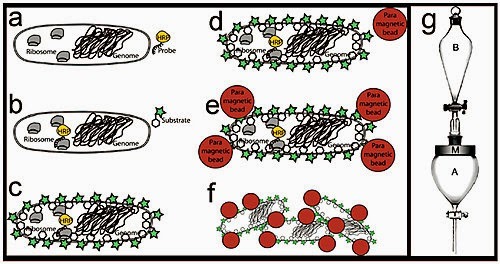 (f) Magnetic separation of labeled target cells bound to the paramagnetic beads from unlabeled microorganisms and contaminating sediments. (g) Apparatus for paramagnetic bead capture. Funnel A contains the hybridized sample and paramagnetic beads suspended in 1xPBS. Ring magnet (M) is seated around the neck of funnel A to concentrate paramagnetic beads and captured cells. Funnel B functions as a reservoir for controlled washing of the magnetically captured sample. Adapted from materials provided by Helmholtz Centre For Environmental Research, via AlphaGalileo.